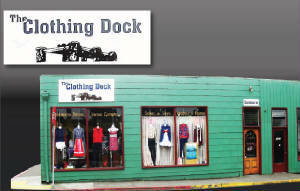 You can now find Good and Evil Twins clothing at the Arcata Chamber of Commerce. They have the "Arcata", "Humboldt" and "California" shirts available. Go show your support and shop locally with the Chamber of Commerce. Pacific Paradise is an Arcata Institution! The store has a fun, relaxed atmosphere where they sell clothes, disc golf, blown glass, candles, etc . . . Good and Evil Twins apparel designs are fun, casual, and often with some bite and humor, and Pacific Paradise is a great fit. Currently they are carrying "Arcata", "Humboldt", "Southern Humboldt", "Save Water to Drink Beer", "California" and "Pothead"! 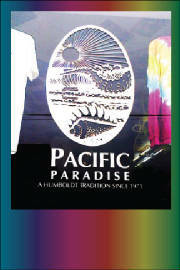 click here to visit Pacific Paradise at their facebook page. 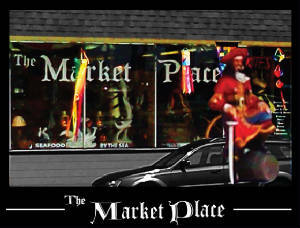 Thank you to all of our Arcata stores that have graciously shown our new business support. We have felt very fortunate to be reaching so many people in Arcata, and now our clothes can be found at The Clothing Dock too! The Clothing Dock is such a great fit for us. They have vintage clothing, new clothing, and so much more. We love this store because of what a fun place it is. The clothes throughout this store are literally surrounded by wigs! The top shelf lining the perimeter of the store has dozens of display heads modeling cool shades, pink wings, elegant wigs and fros! It's awesome. I love the idea of someone walking in to The Clothing Dock looking Plain Jane, and walking out rocking an afro wig and a Good and Evil Twins shirt. Be the first! the store. They are located inside the Bayshore Mall in the Sears wing. The American Indian Art and Gift Shop are carrying our "Native Pride" Hoodies! We will have a picture for the hoodies soon. Check out the gallery, pick up a hoody. It is a beautiful gallery full of traditional and contemporary indian art: baskets, jewelry, pottery, drums, carvings, etc . 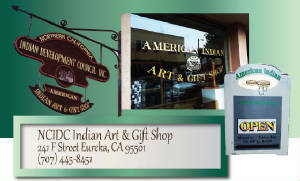 . .
click here to visit the NCIDC Indian Art & Gift Shop at their website. 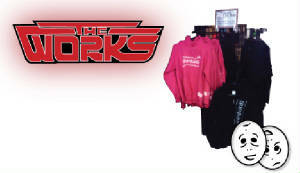 The Works in Old Town Eureka is now carrying our "Humboldt", "Pothead" and "Eureka" ambigram shirts and hoodies! Go check them out. The store has changed a little from when I was a teenager showing up every Tuesday to check in with the new music. 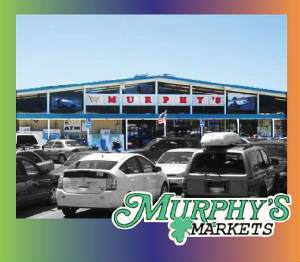 They now have a large selection of DVDs, retro super hero toys, live music and stand-up comedy. It's a really great place to hang out and be around muic. Click here to check out The Works at there website. This is the only retail store in Southern Humboldt that carries our shirts, so go in show your support for Good and Evil Twins! Tsunami Surf and Sport carries our "Pothead", "Garberville" and "Southern Humboldt" designs. Go check it out! Amidst the beautiful gowns for proms and evening wear, and along side McKinleyville's best in women's fashion you can now find Good & Evil Twins hoodies, tanks and tees! Stop by and check it out! Trinidad Murphy's has actually sold Good and Evil Twins magnets for "Trinidad" since the very beginning. Now they carry our "Trinidad","Westhaven" and "Humboldt" shirts. Support our locally owned grocery stores! The Market Place will soon have Good and Evil Twins first custom business shirt! We really dig this store. It is so much fun. Pirate souveniers, pirate souveniers and more pirate souveniers!! It's awesome! Go check it out! We're very excited about this! 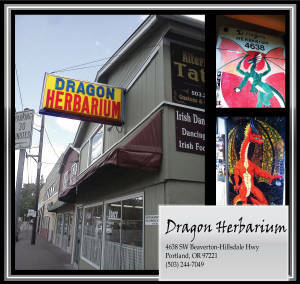 Dragon Herbarium has great selection for bulk herbs & spices, teas, bath & beauty supplies just to name a few. click here to visit Dragon Herbarium at their website. Spencer is now selling "Portland" and "Raven/Eagle" Good and Evil Twins shirts! You really should check out his store if you find yourself in SE Portland. He showed us a couple of electric bicycles as low as $500. They are really very cool. You found the secret message! Call Damian (707) 845-6799, and he'll make you a free ambigram. After you get a custom ambigram design, Click here to visit the best tattoo artist.